Fun and Creative ideas for Teaching English: Top tips: how can PE and school sport help students stay healthy? Top tips: how can PE and school sport help students stay healthy? From pedometers to healthy Come Dine With Me clubs, physical education experts share their ideas for improving pupil wellbeing from our recent live chat. Brain function decreases after 17 minutes of sitting still. I know of lots of innovative primary schools that make sure children aren’t sitting for more than 15 minutes at a time. I have seen some wonderful literacy lessons delivered through physical activity, such as children acting out the story. With approaches like this, alongside a high quality PE and sport programme, schools can help young people achieve their 60 active minutes a day. Alison Oliver, chief executive of the Youth Sport Trust. PE shouldn’t be just within the fabric of the sports hall. For example, in maths and food technology you can compare data on athletic times and calorie count over a six-week period to predict outcomes. Or, to motivate disaffected groups in languages, it’s not uncommon to run a sports days in a different language. History and sport also play a great part in Britain and abroad. Henry VIII was a massive advocate of sport and there are many opportunities for projects between the history and PE department. Steve Sallis, head of education and player welfare at Millwall Football Club. Every Thursday our entire year 7 cohort arrive at school in their PE kit and take part in a physical activity instead of having their normal form time. They have a “personal best” scorecard, which lists performance measures linked to fitness levels, and work with a health mentor who designs activities around improving their performance over time. We deliver it on a day when the kids already have PE (to help with logistics) and have an all-inclusive “fun club” after school, which has fantastic levels of attendance. Kevin Byrne, sport and health development leader at Bebington high sports college. 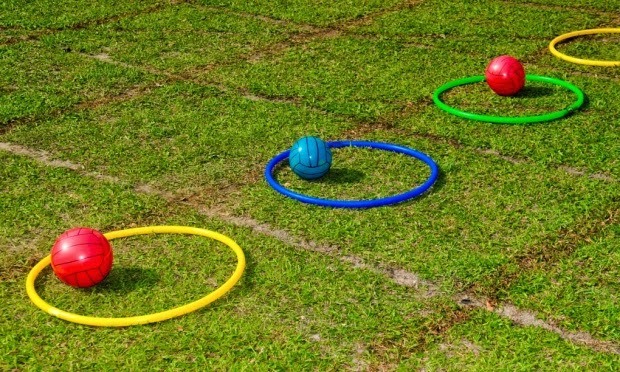 Zoning the playground to ensure ball games don’t dominate and there’s space for a range of activities can inspire and empower a wider variety of pupils to “play” at playtime. Equally, training lunchtime supervisors to organise and lead activity has proven effective. Some of the most innovative and exciting work I have seen is where children are trained to lead and organise peer-led activities. Youth sport leadership not only increases participation, but is a powerful way of developing skills that are important to learning and life, such as communication, organisation and self-reflection. One of the difficulties is how to engage the “inactive” parent. Raising awareness of physical activity within school is a starting block, but leaders have to put PE and sport high on their agenda to begin with. For example, do you report on a child’s progress in PE at parents evenings? Do you invite parents to sporting events - not just sports days, but inter school competitions and festivals? And do you run health clubs where you look at changing eating habits and invite families in? Helen Clark, secondary school teacher at the Elizabethan Academy in Retford and PE coordinator for feeder primaries. Indoor space in particular can be a real challenge for primary schools, where the PE space doubles up as the dining room. However, I saw a fantastic programme running at a school in Cornwall last year where each Friday morning every class teacher offered some form of physical activity in every space in the school – classrooms, corridors, outdoor spaces, everywhere. The pupils were in teams and they rotated around the activities. It was wonderful and demonstrated that despite challenges an active school can be created if there is the will. You need to include the whole staff team, governors and pupils. Sharing the vision is time consuming, but worthwhile. You also need baseline data to prove that intervention is needed. This doesn’t necessarily mean spending hours surveying kids, although we did this. It’s from doing this that you start to notice the real issues and realise that health and wellbeing is so much more than any one person, department or steering group can have a long-term effect on. A model that works well for us is having some of our PE staff go into local primaries to deliver lessons. It gives the teachers at the primary school some ideas and is good professional development for leading sessions on their own. Thomas Brush, PE teacher at Wheelers Lane technology college in Birmingham. We run a healthy lifestyles programme in some of our primary schools, where we work with small numbers of pupils who are not physically active. We engage the parents using initiatives such as a healthy Come Dine With Me competition, where families produce healthy dishes that are tasted by other members of the group. Andrew Dowling, partnership director for Gedling Sports Partnership at the Carlton Academy in Nottingham.